I love wings. I love saucy wings and spicy wings and wings you dunk in big, gooey cups of bleu cheese dressing. I love big ones and small ones and all the in-between ones, which is how I found myself consuming the equivalent of roughly 863 poultry appendages over the course of the last three weeks on a quest to find the best chicken wings in restaurants around Bend. Here are my favorites. 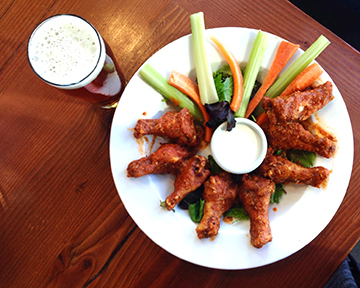 The garlic tahini wings at Broken Top Bottle Shop will make you want to bathe in the dipping sauce. So this is where the whole blog post started. I went to Broken Top Bottle Shop for an event, and decided to try the wings with my mug o’ tasty beer. “Which flavor do you want?” the cashier asked. “Buffalo, garlic tahini, or Georgia red barbecue sauce?” I considered the question while trying not to drool on the counter. “Will you hate me if I want all three?” I asked. Not only did they not hate me, but they brought me the loveliest array of wings that each came with a special dipping sauce. While the Buffalo and barbecue versions were delightful, it was the garlic tahini that sent me swooning. They were perfectly crisp and flavorful, and the accompanying tahini sauce was so divine I dreamt about it that night. And the next night. And the…well, you get the idea. Bonus: every Sunday throughout football season, they’re selling their wings for 50-cents apiece. Double bonus: Their wings are all gluten free. Dig in! When I put out a call on Facebook asking for suggestions on Bend’s best wings, several folks called out the Thai wings of fire at Deschutes Brewery. Though it was a great hardship to have to consume a fresh hop beer sampler and a giant plate of wings on a random Tuesday afternoon, I persevered. 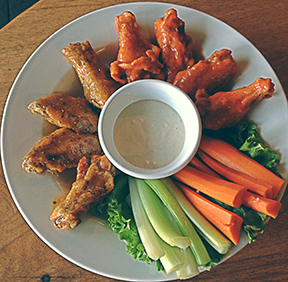 Thai wings of fire at Deschutes Brewery will get you seriously fired up. The Facebook folks weren’t kidding, and the Thai wings of fire were indeed the bomb. The wings themselves are covered in a scrumptious peanutty, gingery coating. The dipping sauce didn’t look like much at first—more of an oil or a liquid than a dressing—so I made the mistake of dunking my wing in it several times for maximum saturation. HOT!!! But also scrumptious and zippy, so if that’s your thing, you might want extra. If not, stick with a more ladylike dip. The Buffalo sauced wings were delicious as well, and since you can try two varieties with each order, it’s worth sampling both to see which you like. Personally, I prefer a creamier bleu cheese dressing to accompany my wings, but if you like yours a little more tangy, you’ll appreciate what they offer at Deschutes. Don’t forget your Bend Ale Trail passport—here’s your first stamp! 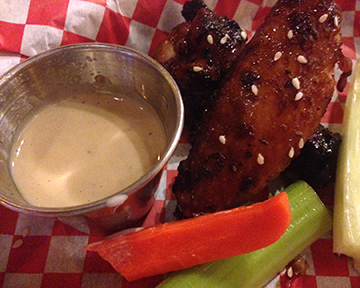 The menu at Platypus Pub features both traditional wings (mild or smokin’ hot) and their own pub-smoked wings, and while I mean no disservice to lovers of tradition, it’s the smoked wings that are guaranteed to rock your world. Make sure you order an Imperial IPA to pair with your wings at Worthy Brewing. They use Draper Valley wings here, and for some reason they always seem larger than in most places. It might just be my imagination, or maybe it’s the effect of sampling my way through their extensive beer selection. Either way, make sure you nab an order of their spectacularly smoky wings with your choice of mild or smokin’ hot sauce. If you’ve tried the wings at Worthy before and weren’t a fan, give them another chance. They just changed their sauce last week, and it’s seriously scrumptious. Worthy’s wings are coated in a housemade habanero sauce that’s slightly sweet but not too spicy. If you’re craving a good pairing, Worthy’s imperial IPA is the perfect complement to this dish. Try to stop by during happy hour when you get six of them for just $5, or show up anytime to score eight for $8. That includes a generous crudité of celery and carrots, plus dipping sauce. Don’t forget to get another stamp in your Bend Ale Trail passport—you’re on a roll now! 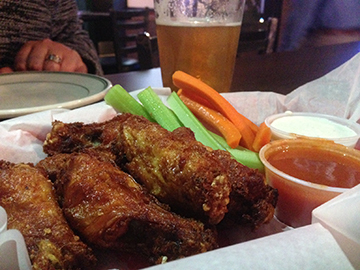 The wings at Sidelines Sports Bar & Grill are my favorite old standby—my chicken wing security blanket, if you will. They’re consistently good, consistently big, and consistently satisfying no matter when you show up and order. 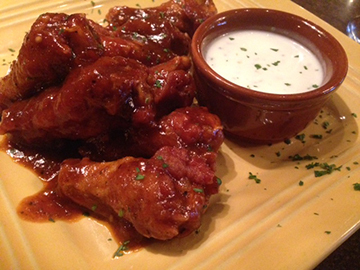 Mouthwatering wings at Sidelines let you control your own sauce distribution. One unique trait of the wings at Sidelines is that they fry them up sauce-free and serve them with little dunking bowls of Frank’s Hot Sauce and your choice of ranch or bleu cheese dressing (the bleu cheese is creamy and excellent, by the way). For those who can be a little picky about the ratio of sauce to wing (me) this is a big plus. Since this is a sports bar, it’s a great spot to hit if you want to watch men in tight shorts running around an athletic court or beating the crap out of each other. For me, it’s a fun place to go on girls’ night when we want cheap eats and super-friendly service, along with a good local tap list. For the record, Boneyard Brewing’s RPM + wings = heaven. This little eastside barbecue joint isn’t a place most tourists will find on their own, but it’s worth a visit if you’re looking for stellar barbecue grub of any sort. 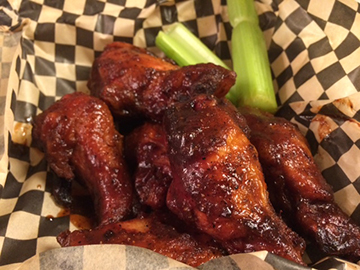 You’ve got lotsa wings to choose from at Wubba’s, but the barbecue ones are simply divine. But we’re talking specifically about wings here, and Wubba’s has some killer ones. The traditional Buffalo sauced ones are tasty, but it was the barbecue wings that really floated my boat. The sauce was tangy and smoky and absolutely perfect, and the wings themselves were generously meaty. Let’s put it this way—my husband doesn’t like wings, and my two step kids can be embarrassingly picky eaters, especially when it comes to animal flesh. When I brought home a batch of these wings, we were literally fighting each other for them. Like, blood was shed. Okay, maybe not blood. But definitely barbecue sauce. They mention the wings in the name of the restaurant, so they’ve gotta be good, right? You’ll have tons of variety to choose from at Hardy’s Hotwings and Hamburgers. First of all, Hardy’s is where you want to come if you’re a serious wing connoisseur. They have so many sauce varieties I actually lost count (though I think it was around 18). Choices range from traditional Buffalo to honey mustard. My personal favorite is the garlic and herb, which pairs beautifully with their housemade ranch dressing (though the bleu cheese is also divine). If you’re really into hot wings and you have a high tolerance for pain, consider taking on the challenge to eat eight of their super-spicy hot wings in eight minutes. If you succeed, you get to hold up a nifty sign showing your time, and they’ll post it on their Facebook page. Previous victors have employed strategies ranging from latex gloves (hey, that sauce can burn!) to giant milkshakes, so give it a go and earn your bragging rights. Like Sidelines, Summit is a sports bar with tons of television screens to make it easy for you to catch whichever sporting event rolls your socks up. 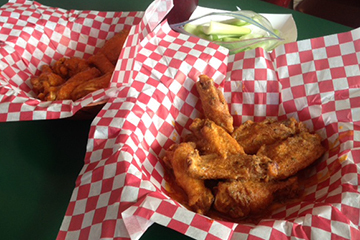 Angel fire and Buffalo wings from Summit – the best of both wing worlds! But besides televisions, Summit has wings. Lots of glorious, saucy, delicious wings. These are hand-tossed with your choice of classic Buffalo, barbecue, or their own Angel Fire sauce. The latter has a sweet/hot Asian flair that’s perfect for those craving something a little different from traditional wings. No matter which sauce you pick, you can count on Summit to have some of the biggest, meatiest wings around, and their bleu cheese dressing is deliciously creamy with big chunks of cheese. Show up at happy hour for extra special pricing. They don’t scrimp on the carrots and celery, either. Bonus: This is one of the few spots in Bend with a happy hour that goes all the way ‘til 7 p.m., a fact that makes me rejoice regularly when I’m getting a late start but still want good deals. 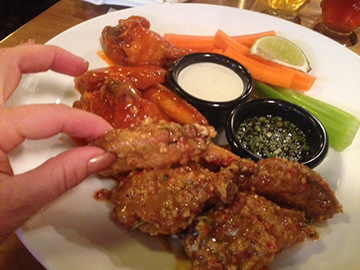 The camel wings at Joolz are the perfect wings for a girls’ night. I say that knowing someone might take me to task for generalizing about female appetites or drinking preferences, but I’ll take that risk. The camel wings are the smallest, daintiest wings in the roundup (I ate ten all by myself!) and they’re also the most exotic. The secret sauce on the camel wings at Joolz will leave you licking your fingers. The secret sauce (which I sweet-talked the bartender into sharing with me) is a mouthwatering blend of middle-eastern spices like harissa and clove, along with fennel seeds, oodles of orange juice and zest, and a handful of other tasty ingredients. The result is a super unique sauce that gets even tastier when you dunk your wings in their housemade yogurt and bleu cheese sauce. Joolz also offers some of the most unique cocktails in town, and their happy hour is divinely good. Pair your wings with an order of their crispy cauliflower, and you’ve got the best girls’ night around. We love the wings at Baldy’s Bar B Q!!! I know almost everyone goes there for all the other delights, but the wings are yummmmm,,,and you can go mild or fire. A side of the beans and slaw and you will say aaaaah! You forgot Bend Brewery. The very best in my book!! !